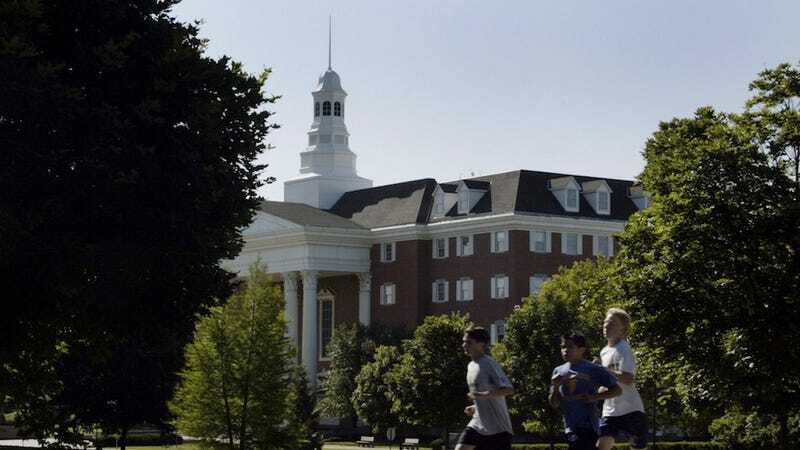 Wheaton College, a private Christian school in Illinois, wishes to be exempt from the Obama administration's newly-enacted birth control insurance mandate, like other religious-run schools and hospitals. But there's one problem: Wheaton doesn't qualify for the exemption, despite the fact that they're adamantly against emergency contraception and birth control and all the unbridled harlotry that proliferates in the presence of the two evil medicines. The reason they don't qualify? Turns out that before all this Obamacare business, the school was already covering emergency contraception. I believe the technical word for what just happened is "Derp." The Obama administration has offered to make concessions for religious-run schools and hospitals that are morally opposed to covering birth control. Rather than mandating that their sponsored insurance plans start covering 100% of the costs of contraception and sterilization this year, holy rollers have got until August 1st, 2013 to make a plan around how they're going to fit icky, icky whore pills into their employees' health care plans. And even after religious institutions' mandate kicks in, they won't have to cover any of the cost of procedures they find morally objectionable — that will fall on the shoulders of insurance companies. In order for religious-run schools and hospitals to qualify for this so-called "safe haven," they had to verify that their insurance policies didn't cover contraception or sterilization after February 10, 2012. Should be easy enough, right? If a religious-run institution truly and sincerely believed that birth control pills cause millions of tiny zygote deaths, they'd totally be on the stick about making sure that they weren't helping their group plan enrollees pay for it, right? Again, derp. The Huffington Post's Laura Bassett reports that Wheaton College, despite its serious, serious opposition to emergency contraception (school leadership's stance is that Plan B causes abortions, which it doesn't, but facts have no place in organized religion), the school "inadvertently" covered emergency contraception after the cutoff date of February 10th, which means they don't qualify for the exemption. And now, even though they're at fault for not taking the necessary precautions, Wheaton's administration finds itself pregnant — with rage. When Bassett asked a school spokesperson how long emergency contraception coverage existed on Wheaton's plan, they referred her to a legal fund that's supporting the school's lawsuit against the Obama administration. Which means they were probably covering Plan B for a very, very long time. And the entire college didn't implode. "Everyone knows Wheaton is a school that lives out its faith," Duncan said. "But today our government is telling Wheaton it is not ‘religious enough' to have a conscience, and so can be forced to participate in abortions or face heavy fines. Wheaton has always provided generous employee benefits, but now the government is forcing it to choose between caring for its employees and honoring its faith." Yes, faith that was so vitally important that it was ignored for God knows how long. One more time, with feeling: Derp.